If you like the Asian theme and want to try something different, that’s exactly what you’ll find in the entertaining 3888 Ways of the Dragon video slot machine produced by iSoftBet. The game utilizes the innovative and challenging layout of 5 reels and 1-5-5-5 rows with no less than 3888 ways to score a big win. Your main task will be the simplest possible – form a winning combination of 3 or more symbols of the same kind and receive a number of coins according to the paytable. See the magical dragons appearing randomly and granting up to 8 additional Wilds, while the Scatters grant from 8 to 18 free spins. 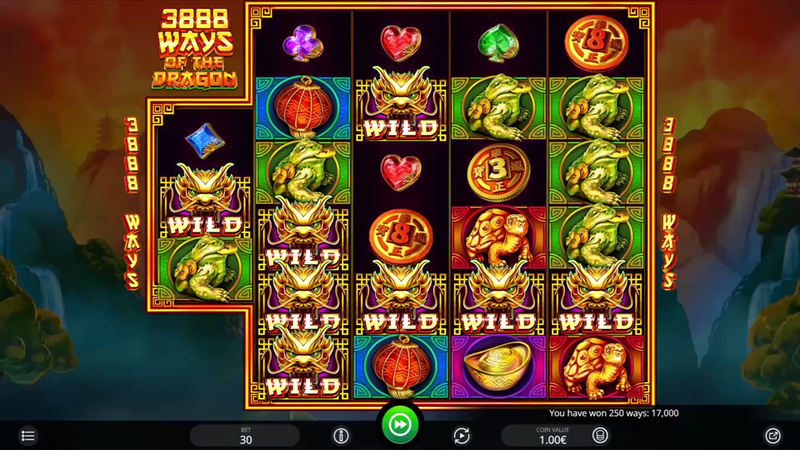 The 3888 Ways of the Dragon Free Spins feature is a mini-interactive game where an animated golden dragon can revive the symbols and fly through the reels. This won’t be only a casual pastime, as it introduces between 2 and 8 additional rounds at the casino’s expense. A colorful valley full of mountains, waterfalls and traditional buildings awaits you in this new adventure! Within a few days, our 3888 Ways of the Dragon slot review will be updated with the official info about the RTP, winning tips and coin denomination. Until that moment, stay here and try one of the rewarding games presented on our dedicated pages. Want to see how 3888 Ways of the Dragon works? Select a recommended casino site from the list below and start playing for free or real – our screenshots will give you a sneak peek!